It’s that time of year again when we all in anticipation of golden roasted turkey, mashed potatoes, stuffing, cranberry sauce and apple pie. I can’t think of any other meal that is more of a comfort food than Thanksgiving dinner. I love to cook and I think I am pretty good at it but for some reason Thanksgiving dinner always stresses me out. I am afraid that the Turkey will be dry, the mashed potatoes will get cold and all the food will not be timed properly. Although I have yet to ruin a Thanksgiving dinner, I like to have a safety net which is to make a beautiful and interesting table so my guests will always remember the decor not the food mishaps. 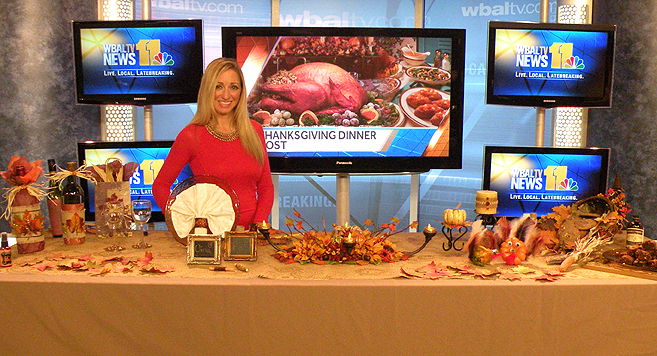 I stopped by NBC Affiliate WBAL to show how to make my Thanksgiving decorations. I had to be in the studio at 5:30 a.m. which is a little earlier than I am used to getting up. I decided to wear my favorite BCBG red dress to look festive for the occasion. It is so soft and comfortable I call it a “pajama dress” which I thought was a good choice considering I would usually be asleep at that time of the morning. This entry was posted in Crafts, Everything, Food, Recycle, Uncategorized and tagged beaded wine glasses, chalk board frames, decorated wine bottle, Gina Tepper, gourd turkeys, paper leaves, place seatings, table decor, Thanksgiving. Bookmark the permalink.